Does Your Commercial Rooftop Project Need a Dual-Axis Tracker? This month, Edisun Microgrids launched the PV Booster dual-axis tracker solution for commercial and industrial (C&I) rooftops in advance of Solar Power International. 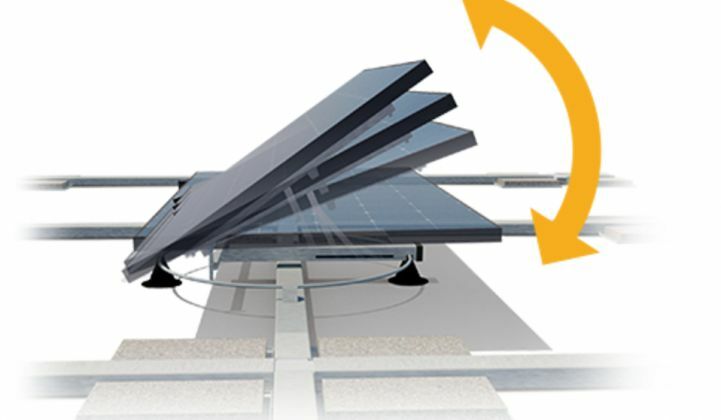 With PV Booster, each rooftop PV module tracks the sun independently using an integrated light sensor, increasing energy production by an estimated 30 percent over a typical fixed-tilt system. While PV Booster adds to the balance-of-system (BOS) costs, about 25 percent fewer PV modules are needed to achieve the same annual energy output, thus lowering total installed system cost and reducing the levelized cost of electricity (LCOE) by some 20 percent. That's what Edisun case studies say, at least. Using an azimuth-altitude dual-axis tracking approach, PV Booster rotates east to west (azimuth) upon a ring attached to a ballasted rail matrix mounted on the rooftop. An arm behind the landscape-oriented module slides to adjust tilt above the horizon (altitude) up to 45 degrees. Although the azimuth-altitude's low wind profile is the key enabler for PV Booster on rooftops, the rail matrix and azimuth ring require more rooftop square area per module than a fixed-tilt system. On the first day of SPI, I happened upon the PV Booster booth, only to find Edisun Microgrids CEO and Idealab founder Bill Gross pitching the technology and product. After visiting the booth a few times and reviewing the case studies, I submitted the following questions to Edisun. The question-and-answer format has been lightly edited for style and clarity. Q: Why dual-axis instead of single-axis tracking? Edisun: We use a full dual-axis tracker instead of single-axis to capture the maximum boost in annual power by adding the second axis. The reason is because we have solved for the challenges posed by the wind. A single-axis tracker pivots the panels in the center so they can track east and west for early morning and late afternoon boost. However, that means the panel is up high in the wind stream, and would not be able to survive a rooftop-mount situation because of the torque-load placed on the roof. On the ground, that’s easy since it’s solved by putting a pole deep into the ground. On the roof, that deep anchoring is not possible, and the roof is not strong enough to handle that. As for the second axis on the ground, if conventional trackers were to add the second axis it would have to move the massive structure altitudinally, and the economics would not pencil out. We invented a new method of making a dual-axis tracker that pivots the panel from the front edge and not from the center. That means PV Booster captures the altitude changes of the sun, plus retracts the module to even lower on the roof than a stationary 10-degree rack. So, the second axis not only gives a boost in annual energy, but it makes the commercial rooftop trackers possible for the first time because we can retract completely flat in winds above 50 mph. Q: How does PV Booster become bankable? Edisun: PV Booster will be securing independent third-party engineering and performance verifications. For our first customers, we will work with a partner or provide direct project finance so that our customers will pay via PPA and not take any risk on our product. Q: What is the PV Booster warranty? As a startup with a limited track record, how do you guarantee spares and qualified maintenance for 20-25 years? Edisun: 10-year with extended warranty is available. We plan to back the warranty as needed with third-party warranty insurance. Q: What is the basis for the operations and maintenance PV Booster delta of $7.5/kWp? Edisun: We have put great engineering effort into creating O&M [practices] that [address] fixed-tilt. First, our system has fully distributed controls, so there is no single point of failure. Unlike other tracking systems that gang hundreds or sometimes even thousands of panels together, we have a separate microprocessor, sensor and controls for each PV panel. Out of a thousand panels, if one or two fail, then the other 998 will work perfectly and remain unaffected. In addition, if two out of 1,000 fail, those two panels still produce power, just not with the 31 percent annual boost. Since our warranty covers that loss in energy production, there should be no O&M needed to fix those two units, because our warranty will pay out those funds. To further increase reliability, we have eliminated the two things that fail the most in trackers -- gearboxes and motor brushes. We designed a unique drive that is direct-drive (the only tracker in the world with no gearbox) and with brushless servo motors (no brushes to wear out). Our motors are rated for well over 1 billion cycles, which would represent thousands of years of PV Booster operation. The motors and mechanisms have been tested in harsh environmental chambers for more than 30+ years of lifetime with no failures. As a result, our testing shows that there will be minimal difference in O&M versus fixed-tilt. That said, in order to be conservative in our case studies, we added 50 percent to typical O&M costs as a reserve. Q: Is reliability data available? What failures have been observed during development? Edisun: We have more than 1,000,000 tracking hours tested so far with no failures. We have not yet seen a mechanical, electrical or wear failure of any kind in all of our testing to date. Q: I observed the cabling to be a potential point of failure. Edisun: PV Booster's cabling approach is similar to conventional fixed-tilt systems. Cabling and connector vendors are all UL approved. The tracker movement flexes the cable bundle +/- 90 degrees once per day. We have run tests of more than 50 years of cable flexing with no wear or degradation, because we have a radius of curvature of the bundle that is well below the stress point of the wires. Q: From the case studies, the energy density of PV Booster per roof area is lower than fixed. What inputs do you have from local governments nationwide about added PV Booster design constraints for permitting? Edisun: Our energy density on rooftops is approximately 33 percent less than more densely packed PV panels on fixed racks. However, we more than make up for that with the superior economics. Because of the spacing, we have a lighter load on rooftops of only about 2 pounds per square foot before ballast. Our product must comply with the same PV standards (UL and ASCE in the U.S.) and must be installed to local building and fire codes, which we do. Q: Does PV Booster stow itself flat if winds are excessive? Edisun: Yes, PV Booster stows automatically when the wind is above 50 mph and has a backup system for doing so. Q: How does PV Booster wake up in the morning? Q: Is it grid-connected or does it begin operation when the morning sun is sufficient? PV Booster provides tangible cost savings to C&I customers subject to time-of-use electricity rates by generating more power during peak rate periods, especially at the end of the normal workday. However, C&I customers seeking to maximize rooftop megawatt-hour power generation regardless of timing might prefer to stick with a fixed-tilt system. Going beyond the PV Booster case studies, I would recommend using higher efficiency monocrystalline PV modules and DC optimizers with PV Booster. Besides attracting dirt and debris, roofs are a favorite hangout for birds and their droppings.